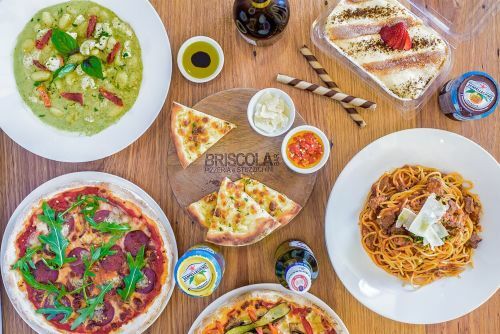 Menulog delivers for Briscola Italian so you'll be able to track your courier on a map. Veal and pork meatballs, slow braised in a Napoli sugo and Parmesan. Crumbed porcini mushroom and provolone risotto balls with roasted capsicum salsa. Bocconcini, oregano, fresh basil and virgin oil. Bocconcini, anchovies, black olives and oregano. Bocconcini, mushrooms, parsley and truffle oil. Mozzarella, smoked leg ham and pineapple. White EVO oil base, potato, sauteed zucchini, ham, bocconcini and rosemary. Mozzarella, pancetta, caramelised onions, olives and rosemary. Mozzarella, smoked leg ham, mushrooms, artichokes and olives. Bocconcini, salami, anchovies, capers, black olives and chilli. White EVO oil base, potato, caramelised onion, fresh rocket and balsamic reduction. Mozzarella, hot veneto salami, red onion, roasted red capsicum and pickled chilli. Mozzarella, salami, pancetta, red onion, cherry tomato and anchovies. Mozzarella. mushroom, grilled eggplant, roasted red capsicum, artichokes and sauteed zucchini. Mozzarella, chicken, cherry tomato, artichokes, red onion and basil pesto. Mozzarella, salami, gorgonzola, caramelised onions, chilli and rocket. Mozzarella, Italian sausage, smoked leg ham, salami and pancetta. Spaghetti, double chilli and garlic with a creamy tomato sauce. Spaghetti, garlic, fresh chilli, parsley, cherry tomato and EVO oil. Penne, mushroom, onion, egg yolk, pepper and Parmesan cream. Sicilian pasta, balzanelli pancetta, white wine and Parmesan with a Napoli sauce. Gnocchi with a classic Napoli sauce. Arborio risotto, porcini mushroom, garlic, shallots and truffle oil. Gnocchi, chicken breast, cherry tomato, basil pesto and garlic cream sauce. Tube pasta with a three meat ragu, chianti and basil. With EVO oil and balsamic glaze. Red onion, cherry tomato, cucumber, oregano and citronette. Shaved Parmesan, pear, caramelised walnuts and fig glaze. Contains two espresso shots per cup.